As a plant taxonomist, most of my work involves determining how many species are in a particular genus of flowering plants, how they are related to one another, and what the correct scientific names for those species are. To do this, I gather and analyze data from a number of sources, including genetics, chromosomes, ecology, geography, and morphology. My colleague Leon Perrie has blogged previously about generating genetic data, including extracting DNA and analyzing microsatellite markers for Pseudopanax species, and detecting differences in DNA sequence data for maidenhair fern species. Here I will show how I go about collecting morphological data from herbarium specimens for taxonomic research. 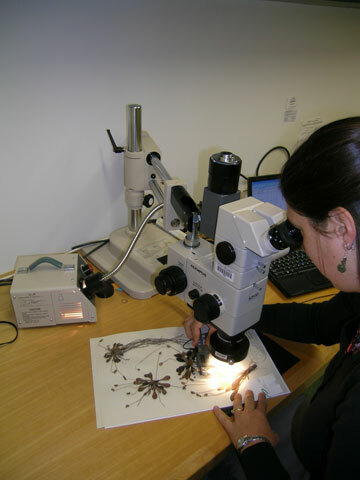 Heidi observing a Te Papa herbarium specimen of Plantago spathulata with a dissecting microscope. Photo by Carlos Lehnebach © Museum of New Zealand Te Papa Tongarewa. The first step of deciding which characters or traits to measure and observe is key. This will vary depending on the particular plant group being studied, and can be an involved process (meaning, probably the subject of another blog!). Some examples of characters commonly used are leaf length and width, presence and type of hairs on calyx, and number of seeds per capsule. The next step is to measure the characters on herbarium specimens collected from throughout the geographic range of the species of interest. Because many of the traits are quite small, a 10x hand lens or (even better) a dissecting microscope is necessary to see them. Rulers or microscope reticles can be used for measuring, but I prefer a digital calipers. Digital calipers are very precise and can be connected to a computer so that the data is transferred directly to a spreadsheet by just pressing a button! 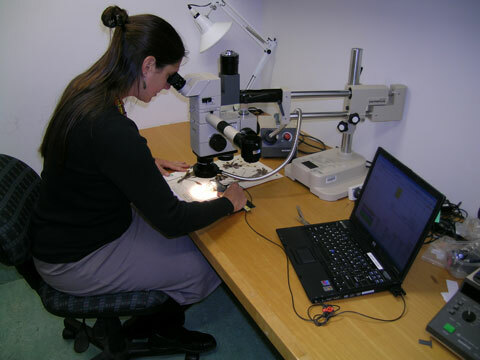 Here you can see Heidi measuring a specimen using the whole set up: dissecting microscope and digital calipers that are plugged into a laptop for instant data transfer. Photo by Carlos Lehnebach © Museum of New Zealand Te Papa Tongarewa. 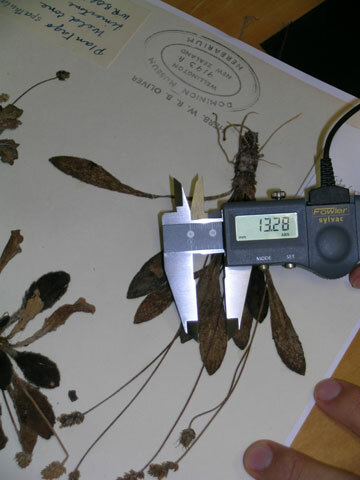 Measuring leaf width (in mm) of a Te Papa specimen of Plantago spathulata with a digital calipers. Photo by Carlos Lehnebach © Museum of New Zealand Te Papa Tongarewa. 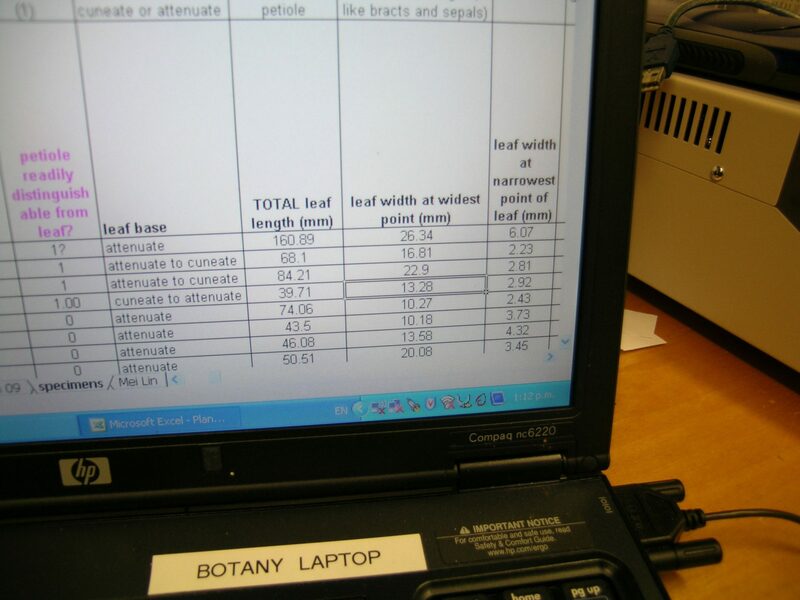 Laptop with spreadsheet showing highlighted cell with “13.28” mm leaf width measurement, that has been automatically transferred from the digital calipers to the morphological data matrix. Photo by Heidi Meudt © Museum of New Zealand Te Papa Tongarewa. Collecting morphological data for one plant specimen, that is, measuring and observing specific traits from the roots, leaves, flowers, and fruits, can take anywhere from 30 to 90 minutes. Multiply that by dozens or even hundreds of specimens, and you can see that collecting morphological data for taxonomic research takes time. Once the data matrix has been generated comes the exciting part: analysis and interpretation of the results. But I’ll leave that for another blog entry! 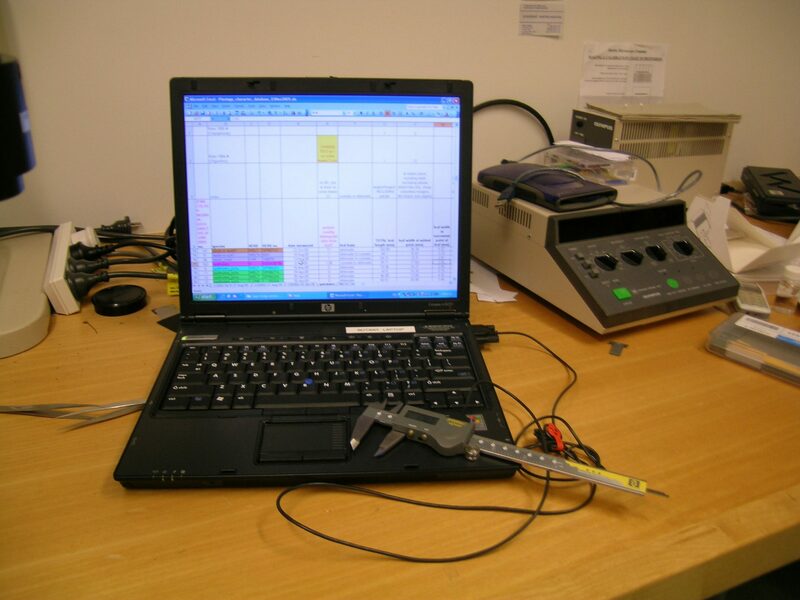 Calipers and laptop with data matrix of morphological characters. Photo by Heidi Meudt © Museum of New Zealand Te Papa Tongarewa. What DISSECTING MICROSCOPE the researcher in the picture above is using? Would you please provide us the details. The microscope is an Olympus SZH10 Research Stereo Microscope. I hope this helps!